Click here to download the 7 Tips to IQ Balance. Do the events in the news today leave you feeling overwhelmed or out of balance? To truly cope with all the demands in the world today means staying in balance. Today’s 24/7 mindset with busy schedules and massive To Do lists leave us little time to relax, care for ourselves and enjoy quality of life. These tracks on IQ Balance Wellness are designed to calm your nervous system, rebalance your physical, mental and emotional health and bring you into the present moment through simple exercise, movement, storytelling and music. You will experience the ancient form of Qi Gong, combined with soul music, to put joy back in your life. Start Your Morning with a 2 minute spine exercise to strengthen your back in order to to carry your daily responsibilities with greater ease. Wake your eyes up using a proven system of medical Qi Gong. Improve Your Loving Relationships through dance and music, opening your heart to new possibilities. Release Stress– Rejuvenate mind, body and spirit through a simple ‘Diving into Oxygen’ exercise. Uplift Your Spirits when Stuck in Traffic or on Your Commute: listen to these eight feel good folk-soul songs whenever you feel stress. IQ Sleep Well Guided Music– Enter a deep sleep by listening to the 70 minute IQ Sleep Well Music track. By using these and many more exercises, stories and songs, you will restore balance to your energy, your life, and your relationships. A delightful, charming and playful Anglo French melody that lures us into a feeling of romance as the sound of the French accordion plays in the background along with the french-speaking language of the singer, all of which feed our longing to find amour on the streets of Paris. The pervasive, seductive strum of the Steel string guitar is beautifully contrasted by the sound of the sharp staccato which reminds us of the clicking of heels of the Flamenco dancer which seduce, entice, energize and compel us to breathe & Dance. This song pays tribute to those souls long passed who have walked on this planet before us and who have left us their wisdom of the 4 directions. And to the angels whose invisible presence among us provide guidance and grace in our lives. You can almost see roving gypsies dancing ’round a fire with their long skirts and pantaloons swaying in the breeze as the minstrels play, beckoning us to join. 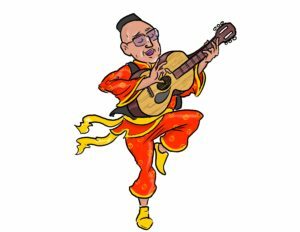 The lull of the guitar wake us to our own gypsy spirit within, inviting us to play, dance and sing along, while the short, snappy sound of the ‘Gitanos’ reminds us that the trickster is afoot – be attentive for things can change in an instant. This song reminds us of the wisdom of breath work and asanas embedded in Indian culture. The melodic strum of the Indian sitar along with the hypnotic beat of the drum puts us in a trance that stirs our sensual nature which it has done for centuries in Indian culture. This song is told from the eyes and ears of an immigrant who has traveled the world and after years of seeking, pays gratitude to this new culture which has given him a place to belong, a place to call to home. The vocals in this song speak with conviction that tells us to go slowly and take our time. The literal meaning in Swahili of Pole Pole is “Slowly Slowly” The Elders are worried that the younger generation is losing touch with nature and it’s natural awakening. The instrument and accompanying melodic vocals partner to weave a story that comes straight from the heart – to pay tribute to the blessings of unconditional love while living a life our dreams are made of. Banyen’s Description: A good night’s sleep is key to a sense of well being. Without it we can lose our work/life balance, feeling tired and drained. Whereas a well-rested person is full of energy. A recent survey found that more than 70% of people find it difficult to sleep a few nights a week. Musician, storyteller and Qi gong guide Iqbal Ishani has a solution for you. This CD can help you sleep dependably and deeper.